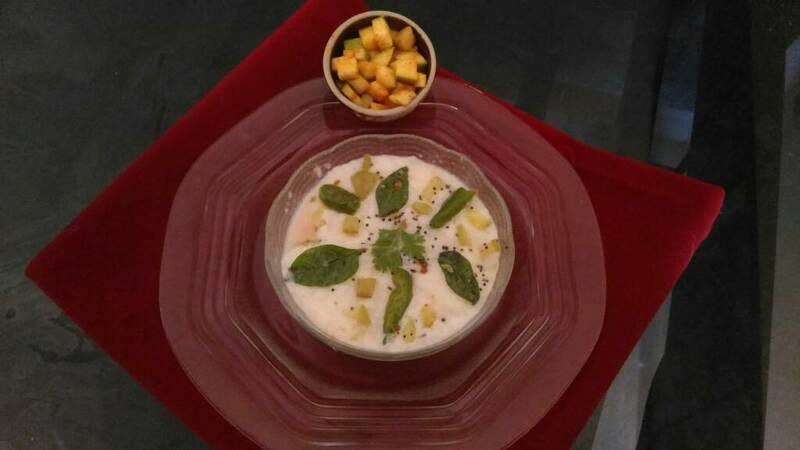 Among pacadi varieties raw mango sweet Pachadi is one of our favorite recipes. This is a Tamil NewYears recipe.This is because on the new year we have sweet, salt spice,bitter,sourand astringent.Significance is that our life is a combination of mixed emotions like good,bad,sorrow,happy,victory, defeat and we should face them equally. This is an easy to cook. Remove skin from mangoand slice it into thin slices. *Take a thick bottom vessel.Cook mangoes with little water with a pinch of salt and turmeric. *When it is cooked add jaggery to itallow it to boil till it dissolves.Now add a pinch of chilly powder.Cook in medium flame to avoid burning. *When it blends well and gets thickened it is ready. Some fry mustard seeds and res chillies add to the dish lastly. 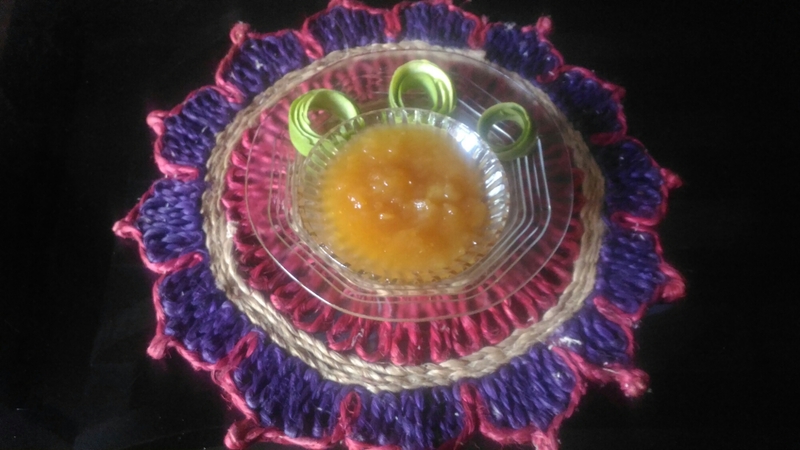 Another option is to prepare jaggery syrup and then to the CURRY.Melt it by adding1/4 cup water and filter it.Add jaggery syrup to the cooked mango. Among different rice preparation curd rice is an easy recipe one.Thayir sadam is served lastin the menu .South Indian meal meal will not end without curd rice.This is both in exotic menu as well as satvic menu.curd rice is offered in temples also.During the month of Margazhiafter chanting Thirupavai and Thiruvampavai they give some rice variety as prasadam this is one such. 1.Cook rice. It should be mushy.so after cooking rice mash it with a laddle. 2.When it is cold add milk,curd and salt mix well. 3.To a small frying pan pour 2 tbs of oil then add mustard seeds when it splutters add urad dhal then add chopped chillies,curry leaves,ginger and raw mango and fry a little and to the rice mixture.. Some like to have with potato fry,some with okra fry and some with vengaya vadagam. One can serve with grated carrot for more healthy version. *can top with pomegranate to make it colourful too. 2.After mixing the rice should be loose. 3.Depending on your taste increase the or decrease the quantity of curd. 5.While adding milk to rice see that the rice is cold..
As a side dish an easy method of preparing an easy pickle. To cut raw mangoes add red chilly powder and required amount of salt.Mix well.If you want can add seasoning too. It’s a long time since I have posted a DIY craft.Thought summer vacation will be the right time.Most kids will love to play with dolls and have fun with it.Decorating a doll for your child will be more fun.You can customise the dress for the doll.Here I have made a simple dress with easily available things at home.you can so it or can guide your child to do it as a craft.If you gift your child as a surprise too. *Blouse bits or any left over cloth after your stitching needs. 1.one small piece of cloth(10cms by 15 cms). 2.another piece a bigger one(30cms by 60cms). 3. In the small piece of cloth make a hole in the centre.sew the edges.Now remove the head insert the piece of cloth and replace the head.Tie a thread around the hip to make the dress fit. 4.Now take the bigger piece of cloth you can change the measurements according to your needs.Now gather small pleats .Put the skirt for the doll and can pull the thread of the dress according to the hip size adjust and fasten it. 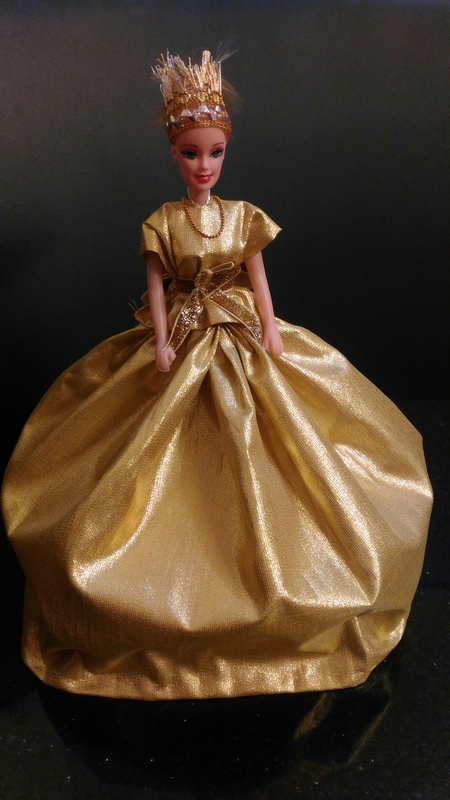 5.Adjust the blouse and skirt.when it is ready keep in empty canand stuff cotton or sponge to make the doll stand erect.This will also increase the height of the doll. 7.If you are gifting to someone else can keep it in a round tray. 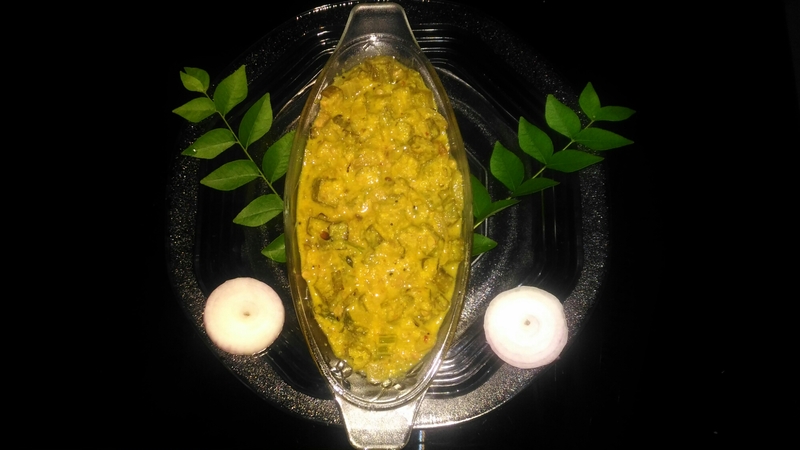 Mango season reminded me to share a recipe with mango and ladies finger.This is a traditional Tirunelveli recipe.We have this dish served for marriages also we prepare this in special occasions where we need oru vaga curry. It’s simple and very tasty recipe.This goes well with sambar,rasam also for blackgram rice. *Cut ladies into small pieces. *Grind all the masala ingredients and keep it aside. *Cook dhal and keep it separately. 1.Heat 3tbs. Of oil add mustard seeds when it splutters add urad dhal then add curry leaves. 2.Now add onions,ladies finger,cut diced mango and saute.After sauting add enough water to cook it. 4.When it is cooked add cooked dhal mix well finally addthe grinded paste to it.Now add chopped coriander leaves. *If u don’t have raw mango can use tomotoes. *Other option is to add tamarind extract instead of water.